Ooh, ooh, ooh! Can we talk about my new running fuel obsession? It's cheap! It's easy! 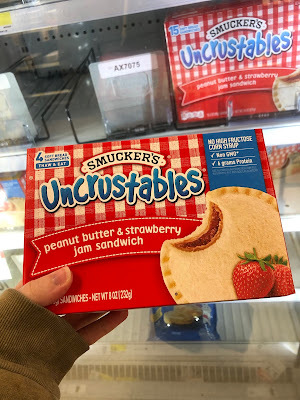 It's... UNCRUSTABLES! Yes, the pre-packaged, pre-assembled, frozen version of the humble peanut butter and jelly sandwich is my new pre-run obsession. But really, can you blame me? It's bread (carbohydrates! ), jelly (sugar! ), and peanut butter (protein!) in a demure 200-ish calorie package (depending on the flavor you select). It's also very gentle on your stomach - I ate two over a couple hours the morning before my last 17 mile training run, and I felt great the whole time. I supplemented with Clif Shots during the run and all was well with my gastrointestinal tract. But here's the real kicker: Walt Disney World stocks them in their resorts. They're marketed to parents and children, so you can find them in the kid's section of the refrigerated cases in the food courts. If you train with these babies, forgetting your pre-race snack is no big deal; just pick up a replacement on your way back to your room! If you're not a peanut butter person or peanut butter could, y'know, kill you, I've seen them in Nutella and sunflower button versions too. You can find them in the frozen section of just about any grocery store. Easy! Accessible! Cheap! Forgetfulness-proof! I am way too excited about such a small thing! But try them anyway! Tell me how it goes? What's your favorite running fuel lately? Umm, genius much? Such a great idea! I actually like the semi-frozen uncrustables more than an actual PBJ. Oooh, I bet the Nutella version would be GREAT cold! BUT. Is it creamy or crunchy pb?? Creamy - I don't recall seeing a crunchy option. May warrant an email to the Smuckers customer service department!